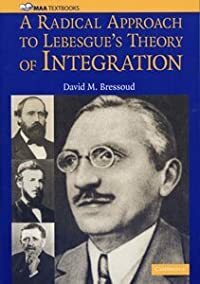 You can follow me on Twitter @dbressoud. In last month’s column, I described the loss of tenure positions and their replacement with other full-time faculty appointments. 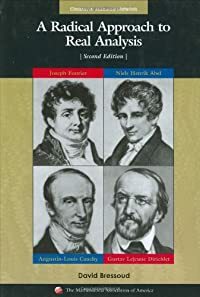 This month, I will focus on how this has affected women earning PhDs in the mathematical sciences, also drawing on the Annual Survey of new PhDs, made available through AMS. 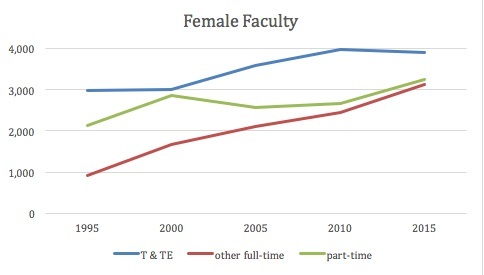 The first observation is that, while the number of tenured and tenure-eligible female faculty has increased by a third since 1995, most of the employment gains have been in other-full-time positions, which have more than tripled (Figure 1). 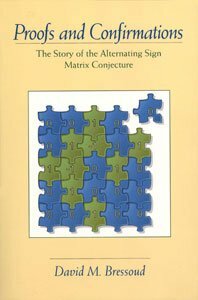 applied mathematics, or statistics. T & TE = tenure or tenure-eligible. Other full-time includes post-docs. Source: CBMS Surveys for 1995, 200, 2005, 2010, 2015. This is particularly noticeable in PhD-granting mathematics departments, where a woman employed full-time is far less likely than a man to be in a tenure or tenure-eligible position (Figures 2 & 3). 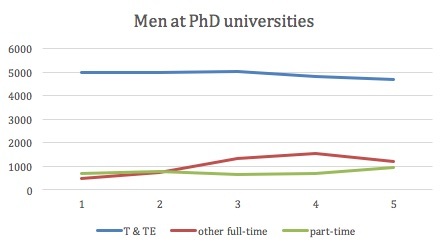 In 2015, 80% of the men employed full-time in a PhD-granting department were in tenure or tenure-eligible positions, this fraction having dropped from 91% in 1995. For women, the percentage fell from 65% in 2015 to 44% in 2015. Figure 2. The number of women employed in PhD-granting U.S. departments of mathematics, applied mathematics, or statistics. T & TE = tenure or tenure-eligible. Other full-time includes post-docs. Figure 3. The number of men employed in PhD-granting U.S. departments of mathematics, applied mathematics, or statistics. T & TE = tenure or tenure-eligible. Other full-time includes post-docs. Despite the appearance that women are making substantial gains in tenure and tenure-eligible positions in PhD-granting departments, the fact is that they have only grown from 9% of those faculty in 1995 to 16% in 2015. In comparison, in Masters-granting departments the percentage of women in tenure and tenure-eligible positions rose from 18% in 1995 to 29% in 2015. At undergraduate colleges, it rose from 26% in 1995 to 32% in 2015. 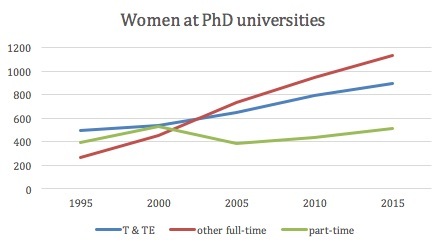 Over the same two decades, women rose from 22% of the PhDs awarded by mathematics departments to 26%. 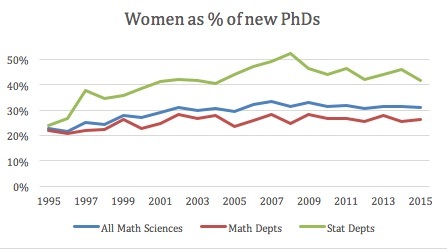 If we look at all PhDs awarded to women in the mathematical sciences, now including departments of statistics or applied mathematics, the situation looks better, rising to 31% in 2015 (Figure 4), with women earning 33% of the PhDs in applied mathematics and 46% of those degrees in statistics. Figure 4. Women as a percentage of new PhDs in the mathematical sciences in the U.S. by type of department. Source: The Joint Data Committee’s Annual Survey available at AMS.org, 1995 through 2015. CBMS does not collect the data that would enable us to make comparable statements about the type of employment gained by mathematicians from other underrepresented groups and the numbers are so small it is not clear how meaningful they would be, but it does appear that efforts to broaden the diversity of mathematics departments is being stymied by the trend to replace tenure-line positions with contract positions. At least for women, their expanding representation in mathematics faculty is happening primarily in those contract positions.